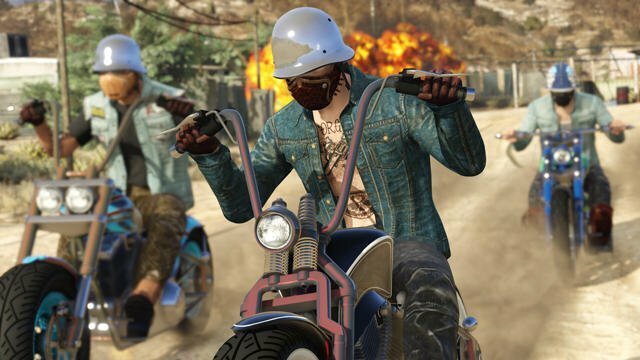 In GTA Online’s new Biker DLC, out now as a free update, you can kick and melee while driving a motorcycle, which can lead to some hilarious results. There are plenty of videos on YouTube showing this new feature in action. Who knew the simple act of kicking an NPC would be so amusing in a world full of deadly weapons? That’s just the tip of what makes the DLC so ridiculous—but incredibly fun. 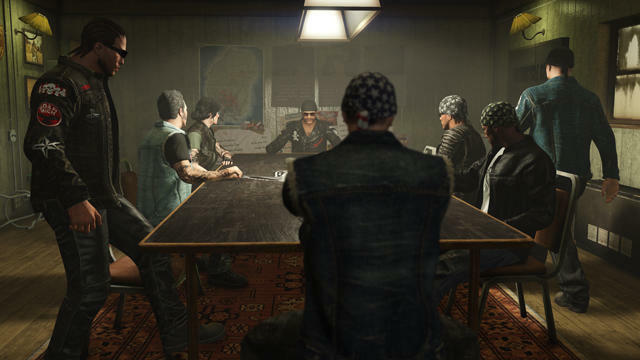 The Bikers DLC essentially puts players into an episode of Sons of Anarchy, complete with a clubhouse, on-staff bartender (who is angry as all get out), and access to a number of nefarious underground businesses, including an option to buy a marijuana operation. If you’ve ever fantasized about starting your own no-good motorcycle club, this DLC is for you. Bikers brings a range of new ways for clubs of up to eight players to earn their keep, battling rival MC’s and other criminal factions. Enterprising players can form and be the President of their own MC, while anyone seeking MC life can join as a Prospect. As newcomers prove their worth, Presidents can promote Prospects to meaningful roles within the club’s structure including Vice President, Road Captain, Sergeant-at-Arms, and Enforcer. Starting your own motorcycle club takes a lot of capital, so you’ll need a few hundred thousand dollars just to get started. Once you do, you can start your life of crime, whether that be completing missions or simply wreaking havoc on the city’s residents. How much you’re willing to commit will determine your overall experience. Thanks to a slew of new vehicles, clothes, tattoos, and weapons, the Bikers DLC makes it easy to play the role of rebel. GTA Online has always allowed players to freely express themselves in the game’s open world. But I find the new DLC a breath of fresh air because it gives players the opportunity to play a specific role. It’s like virtual cosplaying; if you wholeheartedly commit to becoming a biker, it’s a lot of fun. Of course, you could already do most of these things before, but now there are missions and storylines specifically tailored to the biker experience. And once your clubhouse grows, you really start to feel like your persona is deeply connected to your gang. I know that sounds completely absurd but it was a lot of fun to feel like you are taking on this new role. GTA Online is always pretty loose with letting people create their own online personalities and looks. The Bikers DLC feels more focused and deliberate in the kind of experience it’s trying to create. What’s cool is that when you do missions, you can still interact with characters from the online world. We were doing a mission that required us to destroy six vans of a rival gang, and in the middle of doing so, a random person intervened and started killing us. There was another one that had us breaking someone out of prison, and once we did, rival gangs were free to stop us. If you prefer to ride solo, you can do so, but you’ll get the most out of the DLC either by starting your own crew or joining one. If you’re looking to join a club, you can mark yourself as available and Presidents can then invite you. A friend and I started a club and it quickly grew by a few more heads. It’s that easy. I’ve only just begun to dig into the DLC so I haven’t even scratched the surface but I’m impressed by how Rockstar continues to churn out such high-end online content. The Bikers DLC feels a lot different from the other stuff that’s been added to GTA Online, and it feels like you’re crawling into an underworld that’s more raw and authentic. Now, if you’ll excuse me, I have a document forgery business to run.